I started oliphantum back in March 2016 as a way to document our life, our world, the way we see things and to show how normal life as a mother of two unfolds in South Staffordshire (if life with children can ever be described as normal that is!). It was a way in which to get some of my creativity back (I’m a marketing Account Director by trade) and do something fun! And it was also a way to help me get my head back to “normal” after a horrific experience in September 2015. That horrific experience was the near-loss of our 3 month old son to meningitis. It’s Meningitis Awareness Week this week (19th – 25th September) and so I wanted to share our story with you, in the hope that it will help to spread the word about how serious the disease is and make more people aware of the symptoms we all need to look out for – especially in babies and toddlers. Henry had been a little unsettled and unusually cranky all day, and when he started to be sick I knew that something was wrong. We called NHS 111 (the free non-emergency advice line) and they advised that we take him to the Out Of Hours service. The Doctor there believed that Henry had a virus and that we should just take him home and monitor his symptoms. He slept fitfully that night and the next morning he threw up each and every milk feed (a massive disaster since he was breastfed and I wasn’t pumping!!). He was restless, kept arching his back and I just couldn’t settle him. We walked his sister to pre-school and on the way home I called the Doctor and booked an emergency appointment as Henry wouldn’t stop being sick and his moans had turned to a constant, high pitched cry (a big symptom that I had no idea about). I raced him to the surgery as I knew that something was wrong, this wasn’t my baby. Henry had a fever but it was only just over the ‘normal’ levels, however, because he was just 3 months old the Doctor immediately referred us to the paediatrician at our local hospital. The triage nurse at the hospital instantly knew that something was wrong, Henry’s screams were now ear-piercing and there was such pain in his cry. He was quickly becoming floppy and unresponsive and I was very scared. Meningitis hadn’t even crossed my mind at this point (but I later learnt from the nurse that she thought it straight away). The Junior Doctor assigned to Henry asked immediately for permission to perform a lumbar puncture and explained that he felt it necessary as he believed Henry was suffering from meningitis. My whole world fell apart. I couldn’t hear another word that he said as my ears were ringing and all I could think was the worst. From that point on things happened so quickly. Henry had a cannula inserted and was whisked away for the lumbar puncture. The team advised me not to attend the procedure, and I was glad not to have been there – he was two rooms away but I could still hear him screaming. When they returned him to me he was so lifeless. He was deteriorating so quickly, and we needed to move fast. We were placed into isolation in a side room and Henry was hooked up to all sorts of different machines to monitor his oxygen levels, vital signs and to administer fluids and medication. I couldn’t believe what was happening. At this point I hadn’t even had a chance to call Mr O to relay the news, so I waited until he arrived that evening with Ruby (our two year old daughter, for anyone new to the blog!). It was when Ruby arrived at the hospital that we started to worry about whether she would catch the disease too, but luckily the Doctors assured us that because meningitis has no incubation period, she would be showing symptoms by now if she had it. The diagnosis of bacterial meningitis came back to us within a few days, and so Henry stayed on the life-saving medication that he had been originally prescribed. His temperature was highly unstable and would drop dramatically throughout the day and night, so he was constantly monitored every hour for a week until he stabilised and finally started to show signs of improvement. After a fortnight in hospital we were allowed home, but had to return each day for another fortnight so that Henry could have his medication through his cannula. His hands were so swollen after all the medication and fluids, but slowly that started to return to normal. We were finally discharged a month after that bloody awful day. It’s been a year since all this happened now, and it has been an interesting one! At first, every little thing had me on edge. I didn’t want to sleep, I didn’t want to leave him for a second…which was difficult since we also had Ruby to love and care for! She started playing up and being a bit naughty, and I don’t blame her either! Here comes this newborn baby, taking away mummy and daddy from her a little and then REALLY taking mummy away for almost a month as she cared for that baby in hospital. What a mess it all was. A month or so after we were fully discharged we were called back to the hospital for a routine hearing check, and it was at this check that we were told it was likely that Henry’s hearing had been affected by the meningitis. We have had three follow-up hearing tests since that point and unfortunately Henry’s hearing is deteriorating and there is fluid building up behind his eardrums. We have been advised that Henry will need grommets and/or hearing aids to enable him to hear fully. If you follow my blog and IG account you’ll know that we have been so lucky. We will always be eternally grateful that we caught the disease so early, and that the Doctors and Nurses listened to my instincts that something was wrong – as the story could have ended up far, far worse than the situation we now find ourselves in. Meningitis can kill within hours. It’s a vicious disease, and is (sadly) quite common, especially in babies and children. I bet that the vast majority of you had “the talk” in assembly when at high school, and I bet that you’ve all seen and heard so many things about meningitis in the past. Perhaps you even know of someone that has had meningitis. But, somehow, it’s still a disease that is all a bit too ‘background noise’ for us to pay much attention…and you never think it will happen to you, but really it’s never been more important to pay attention and learn about the symptoms of meningitis and septicaemia. It can be quite confusing, with some conflicting symptoms. And it’s NOT all about a rash! 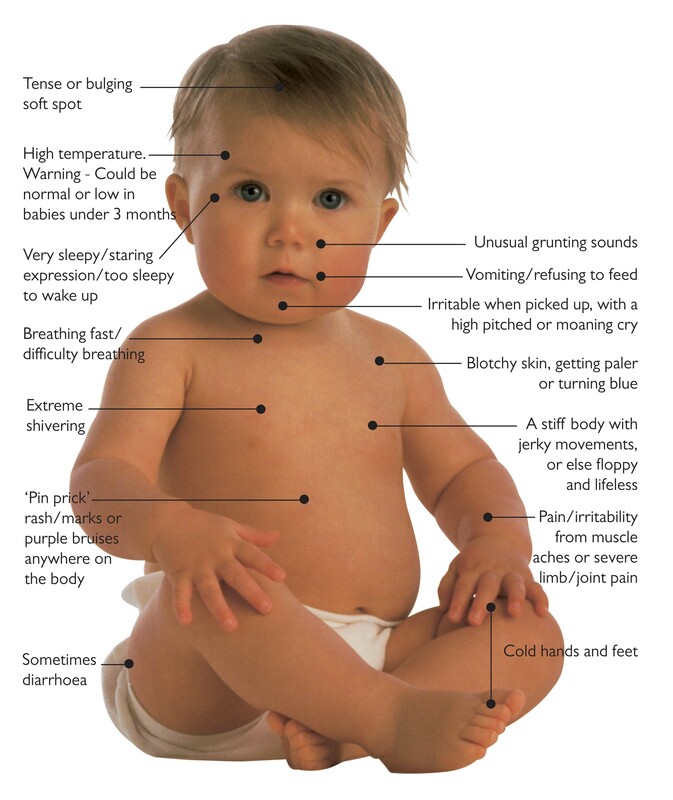 Looking back on it now, Henry displayed the vast majority of these symptoms…but meningitis didn’t even cross my mind! You won’t necessarily know that it’s meningitis. So if you feel something is wrong, don’t wait – go and pester, tell the Doctor that you feel that there’s something really wrong. And whatever you do, please don’t wait for a rash. A rash can mean septicaemia. And septicaemia (the blood poisoning version of the disease) is much more life threatening and dangerous to your little one. Click here to scoot on over to the Meningitis Research Foundation website and read up fully about the symptoms. Do you have experience of meningitis? What’s your story? I’d love to hear your thoughts and how you dealt with the experience. Today I give you one of the most precious people that I will ever have in my life…my first baby. Today I trust you, someone I have met but three times, with my pride and joy. My daughter. My heart. Today and for the next school year, I trust you with her happiness and her education. Two of the most important things in her life. The foundations for her future. So, dear teacher, today I want to apologise in advance and tell you a little about my daughter. My Ruby. Whilst we’re not the first to go through this process, it is the first time for us. So please understand that we are anxious. So scared for how our little love will cope with the big world stuff. Wiping your bottom properly when your arms just aren’t long enough to do so. Getting un-dressed/dressed under pressure when you’ve never really had to before. Choosing your own meal for the first time, and having to choose quickly because there are tonnes of other hungry children waiting in line behind you. Carrying a tray full of food and a drink into a hall full of children you don’t know…the list is endless. How will she get on with it all?! You probably know all too well that she, like all the others, will be just fine. But we don’t know that. Not yet. Not until we return at the end of a day that seems so long to (hopefully) a smile and a promise to return tomorrow. Our girl is so excited to join you. She is thrilled at the thought of learning to read and to show you how well she can write her own name (albeit that she often writes it backwards..she’s left-handed, you can’t win them all!). She desperately wants to make new friends and play with them, no matter how shy she might first seem – she most definitely isn’t! She loves numbers and she can count to 100 (but she always misses out the numbers 20, 39 and 70). Oh, and she sounds like some random cockney when she says the words “girl”, “world” and “three”. No idea. And finally, can I ask you, dear teacher, to please look after her. Please be kind and try to love our girl just as we do. Please be caring and understanding with her. Don’t let the system bog you down. And underneath it all, no matter how much we may cry today, we are so excited for her and we’re with you all the way. I was originally planning to be all “I don’t particularly care what people are saying, summer hasn’t ended just yet” and chat about the fact that technically it’s not over until later in the month. However, having woken up this morning shivering, looking through the window at torrential rain and to a baby literally covered head to toe in poo (I guess the Lactulose has finally worked) I am pretty resigned to the fact that we have probably already had the last few days of summer. All things considered, the small amount of summer that we have had has included some lovely times, like our holiday to Tenerife, trips out, visits to and from family and friends and our many child related adventures! But, with Ruby starting school this coming week things have been a bit fractious of late, and so our efforts to make this summer one to remember for her have gone a bit pear-shaped to be honest. Think screaming, curly haired tantrums when daddy drives the car but she wanted mummy to drive and peas being thrown in every direction because she wanted carrots and you’re close to (never really) understanding our four year old and how draining the last few weeks have been. So, last weekend, spontaneously wanting to “make the most” of those precious last few days of summer we took the children to Calke Abbey, a beautiful National Trust property in Derbyshire. It’s dubbed the ‘un-stately home’ as the owners were ruined and simply didnt look after the house because they couldn’t afford to (who could!?). The NT have kept it in its shabby state but work hard to preserve it just as it was left…but I just know this from snatched glimpses at fact sheets and hearing snippets of the video about the house because I’ve never actually been in the place! Nope. Don’t be daft. There’s a playground and sheep to see instead! I thought it would be a great day…we walked round the parkland spotting deer, but Ruby thought that was boring. We climbed trees and did muddy puddle jumping, but Ruby thought that just wasn’t fun enough. We had a picnic overlooking one of the nicest views in the whole estate, which Ruby actually did enjoy because it included food, and we spent time doing crafts and playing in the play stables…which didn’t last long enough and ended in yet another tantrum. Everyone suffers the rage of a four year old at some point in time, I know we’re not the only ones. And I know that Ruby is really no different to the other four year olds out there and, whilst it wasnt the idyllic day I had imagined it would be, it was time spent together as a family and, considering the weather this weekend I am glad that we took the opportunity for one last effort at some summer fun. Carrying Henry round on my back could have been the biggest mistake of the summer yet for me though! In a nutshell I’m now resigned to the fact that summer is over and that school is just around the corner and so I have taken the (wise or stupid, I’ll decide later!) decision to spend the next few days just with Ruby. We’re basically going to do all the fun stuff I wish we’d done earlier in the summer…whether it’s raining or not! And we’re also doing the bits and pieces she has wanted to do but that we haven’t had a chance to…including Finding Dory at the cinema, which basically means I’ll be a blubbering mess by 2pm tomorrow. Summer, thanks for popping by, you’ve been interesting. Here’s to next year!